This last Friday, July 15 at 5 p.m., the Art of Disney Parks at Downtown Disney Marketplace hosted former Walt Disney Imagineer Maggie Parr, who has showcase her exciting collection of Renaissance-inspired Disney character portraits. The collection is a beautiful art series that honors characters in iconic paintings from a few of the world’s most famous and historic artists. To help celebrate Maggie’s appearance at Walt Disney World Resort, I want to reintroduce you to Maggie and her artistic styling that makes her artwork so special and enchanting. I’ve taken a snippet of Michelle’s interview with Maggie from an earlier article and posted it below, so you can hear from Maggie first hand on what inspired her to create the iconic Disney Renaissance collection and how she chose to depict the characters in the Renaissance style. Maggie: I originally got the idea when Imagineering hired me to paint Disney characters in famous artworks for Tokyo Disney Sea. I really enjoyed imitating classic paintings. But it was also an interesting challenge to figure out subtleties of the characters: how they’d look in costumes, what expressions they’d have, how they’d look rendered in different mediums and techniques. I realized that Goofy, and all of the characters, have their own psychology. In fact, when I painted them, they came alive on the canvas, and I began to appreciate and understand the Disney characters in a whole new way while inserting lighthearted American humor into serious European history. Mickey and Minnie are beloved to the American imagination – so it made sense to paint them as “Queen Minnie” and “King Mickey” after famous royal portraits. It feels fun and irreverent to frame Goofy and Donald as English noblemen in the 1700s. 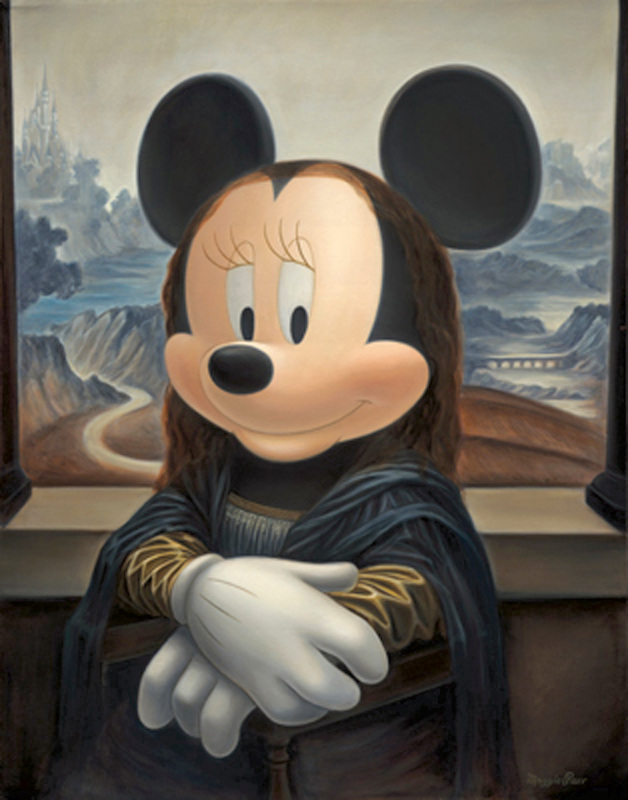 And of course, portraying Minnie as the Mona Lisa is the ultimate parody. Tip: Several of Maggie’s “Renaissance” inspired pieces, including “Minnie Lisa” and “Duck With A Pearl Earring,” will be available on the Disney Cruise Line in the months ahead. 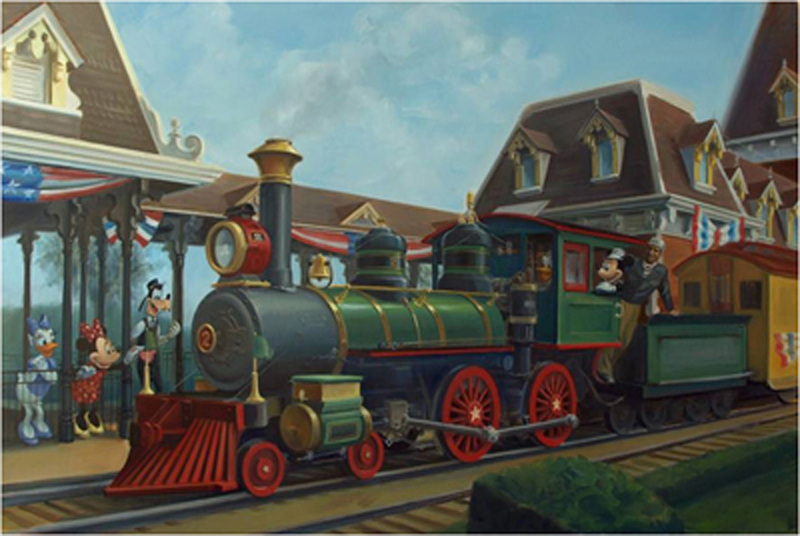 Michelle: Two of your upcoming pieces will surely capture the imagination of Disney enthusiasts and Railroad historians everywhere. Can you give us some highlights and insights on these pieces and why you chose these subjects to commemorate the 55th Anniversary of Disneyland park? Maggie: When I got the invitation to develop artwork for the 55th Anniversary, I jumped at the chance to portray scenes from the opening year. I grew up in Ohio, so I didn’t get to visit Disneyland park until my early 20s; but I can feel its history every time I walk through the park. There’s a certain magic that’s unique to Disneyland. It’s something I try to capture in my paintings. And because it’s a place that was born in the imagination, it seems natural to picture the characters walking around as if they secretly live there. That’s why I painted Sleeping Beauty in front of her castle, and Donald as the engineer, and Mickey as the fireman of the train. To me, they’re the living force that animates these places. I decided to paint the castle because it’s so iconic; but I was surprised to learn that it was originally painted white. I left Aurora’s dress pink (instead of blue) to honor the current coloration of the castle. I also wanted to paint one of the trains because they’re just so fun. I originally considered portraying the No. 1 engine, but after learning that the No. 2 was Walt’s favorite, I had to paint that one. I consulted Jeff Remy – a train enthusiast and one of the engineers on the Disneyland Railroad – and he generously provided advice on the mechanical and historical details. Of course my pieces are never completely realistic – I add characters and fantastic details to make it more magical – but I try to portray the real-life setting as accurately as possible. Click Here to read "The Art of Jim Shore"
Click Here to read "The Art of Randy Noble"
Click Here to read "The Art of Darren Wilson"
Click Here to read "The Art of Larry Nikolai and Chris Crump"